Has greater bends and turns than the standard bowline. This creates more stress and friction, and weakens the knot. 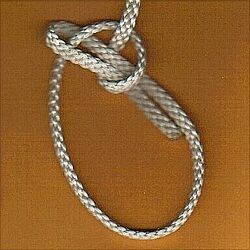 The Eskimo bowline is a knot that places a loop in the end of a rope. Whereas the standard bowline knot loops the working end around the standing part, the Eskimo bowline loops it around its own descending part. It holds slightly more securely than the bowline, but is more difficult to tie. The Eskimo bowline can be used to carry people in rescue, climbing or mountaineering, particularly if a stop knot is added for protection. It can also be tied on a bight for better comfort and safety. This page was last edited on 30 March 2007, at 22:24.